Amigo X Neck Knife with Satin blade of AUS-8 steel Amigo Series was specifically created for carrying around the neck. During the development of the series engineers of Kizlyar Supreme tried to incorporate the most important factors for an ideal neck knife. First, of course, is security. That is why the unique sheath for Amigo was designed with extra precision and numerous tests were conducted to ensure the security of the sheath, after that we confidently approved the final version made of modern multilayered high durability G10. Secondly we considered the usefulness of the knife. With Amigo knives you can do a lot – they were designed to allow a reliable and comfortable grip, while the length and blade shapes make doing any work with the knives a pleasure. Third factor that we accounted for is the speed of extraction. We are sure that a perfect neck knife must be the first and quickest to come to aid its owner in any circumstances, be it a security belt cutting in an emergency or the urgent peeling of an apple. Amigo sheaths are supplied with a G10 lock that instantly releases and prepares the knife for action with a simple thumb press against the sheath or a pull to any side. Our fourth factor is the size and weight. Since no one wants to walk around with a bowling ball on their neck we tried to make the knife as lightweight and compact as possible without compromising its useful properties. We believe we have reached a dimplomatic compromise and the Amigos came out eager to work hard. The fifth factor we considered is the high quality materials. Most important among the materials of a knife is of course the blade steel. The Amigos have two options – AUS-8 and D2. D2 is one of the most popular premium steels in the world because it offers unparalled edge-retention capabilities. The combination of exceptional wear-resistance, high hardness (61-63 Rockwell) and acceptable corrosion resistance make this steel a perfect choice for serious knives. D2 has relatively high chrome content and this is why it is often called “semi-stainless”, the steel is a good compromise between the constantly warring camps of high carbon and stainless steel fans. D2 is more resistant to corrosion than most high carbon steels, but still needs cleaning after use and an application of oil from time to time. AUS-8 is also considered to be a great knife steel in the quality middle price range featuring high corrosion resistance, high hardness (58-59 Rockwell) and capability of easy sharpening. The handles are 3D contoured G10 in different colours – some users prefer bright handles – orange or blue, that could be better visible when dropped in a forest or at darker times of day, while some prefer traditional black handles so as not to attract unwanted attention. A length of paracord is included with the sheath. Made by Kizlyar Supreme. 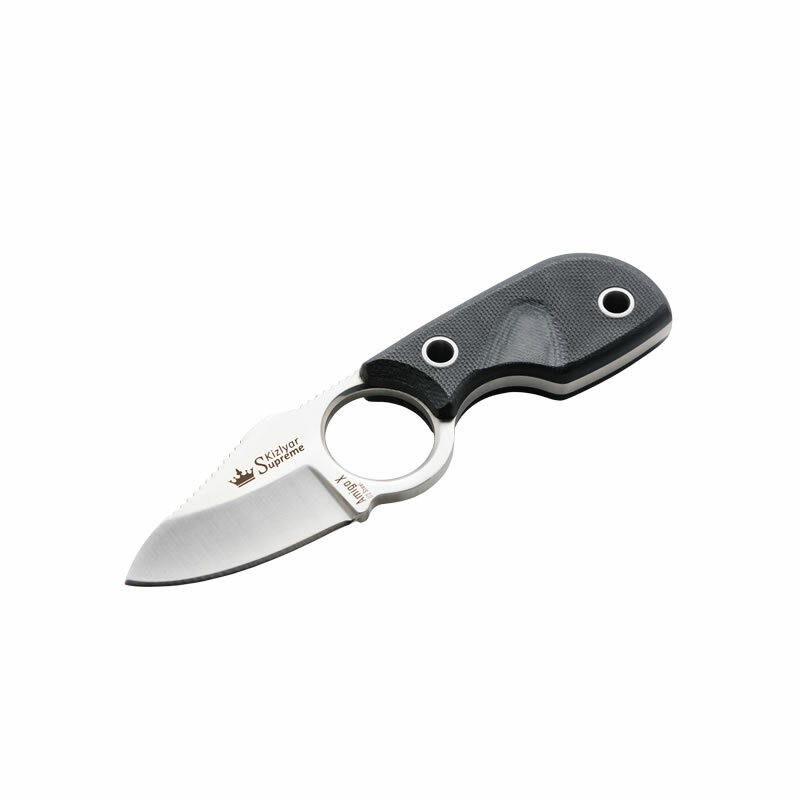 Key Features: Black G10 Handle D2 Steel with Satin Finish Tension Based Secure G10 Sheath Specifications Overall: 5.25″ Blade Length: 2.75″ Handle Length: 2.5″ Thickness at Guard: 3/16″ Blade Steel: D2 Handle Material: G10 Specs will vary slightly from piece to piece.